In the opening years of the last century a substantial red brick building arose among the sandhills facing the Hoylake promenade. Work was completed in 1909 and on Monday 10th January 1910 the doors were opened on what was to be known as ‘The Parade Higher Elementary School’, Hoylake, Cheshire. 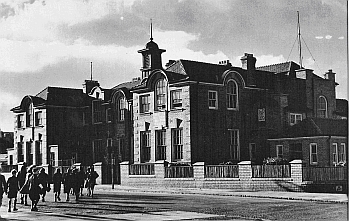 In 1974 Hoylake changed from being a part of Cheshire to become part of Merseyside, and many of the official records of the early years of the school have been lost. One of the claims of Wirral Borough Council, its officers and councillors was that the Parade buildings were near to the end of their useful life and would probably fall down if they weren’t knocked down.